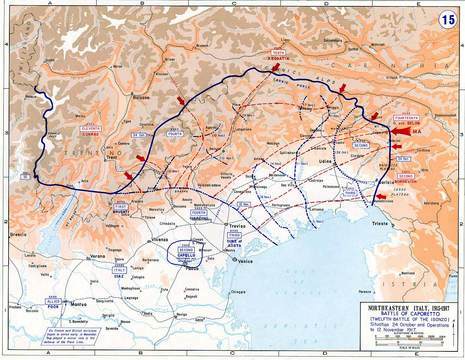 The Battle of Caporetto (also known as the Twelfth Battle of the Isonzo or the Battle of Karfreit as it was known by the Central Powers; Slovene: Bitka pri Kobaridu), took place from 24 October to 19 November 1917, near the town of Kobarid (now in Slovenia), on the Austro-Italian front of World War I. 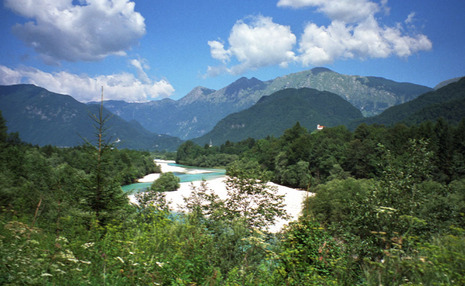 The battle was named after the Italian name of the town of Kobarid (known as Karfreit in German). Austro-Hungarian forces, reinforced by German units, were able to break into the Italian front line and rout the Italian army, which had practically no mobile reserves. The battle was a demonstration of the effectiveness of the use of stormtroopers and the infiltration tactics developed in part by Oskar von Hutier. The use of poison gas by the Germans played a key role in the collapse of the Italian Second Army. During World War I, Below took part as a commander in the Battle of Gumbinnen, the Battle of Tannenberg (1914) and the Second Battle of the Masurian Lakes (February 1915). He fought in campaigns in Macedonia (1916) and in Italy (1917), where he defeated the Italians at Caporetto. In 1918, he commanded the 17th Army on the western front. Below retired in 1919.